Stinky definitely helped. 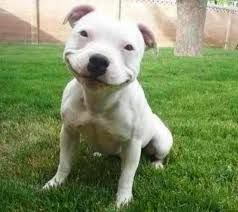 I love dogs, and am wearing a new smile this morning. Thank you! Sorry you are having a hard time. Stay bright, smile; you'll get through. Maybe Stinky can help. The last few months have been busy, and somewhat melancholy for me. We have had two deaths in my family, several weddings, and a birthday. Each event came with its own set of challenges. I handled the weddings the best. I found it easy to stick to my food plan and sneak in some exercise. Weddings always fill me with so much hope. I wasn't able to attend the funerals due to taking a new job. It made things hard emotionally. I had two or three bad days, but my new job is so wonderful that I was able to recover with no gain. The birthday oddly enough is what threw me off my path. Beginning in October, there are three very special people that celebrate birthdays. They are not in my life right now, and it breaks my heart. Needless to say, things have been very challenging lately. I am trying to look to the future knowing that time changes things. I am trying to not be overcome by things that I have no control over. I can't let these things hold me back either. I have to remember that commitment means even when things get hard. I hope all of you are going the distance too. Keep on keeping on, even when things get difficult!